Femtosecond lasers have excellent characteristics for materials processing due to their ultrashort pulse widths and extremely high peak powers. When a femtosecond laser beam with a moderate pulse energy is focused into glass, multiphoton absorption or tunneling ionization is confined to a region near the focal point inside the glass. Femtosecond lasers can thus perform internal modification of glass. Internal modification is widely used to fabricate microfluidic structures and micro-optical components, which can be used to produce biomicrochips for biochemical analysis. 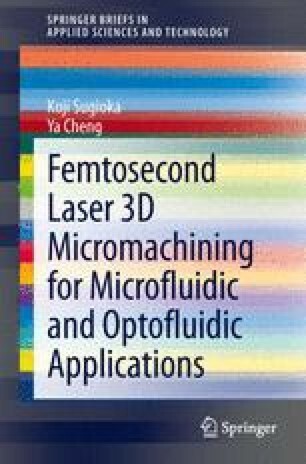 This chapter reviews the fundamentals and characteristics of femtosecond laser processing. It also introduces state-of-the-art femtosecond laser processing.